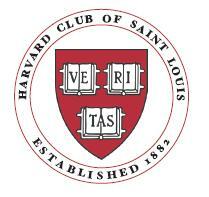 Founded in 1882, the Harvard Club of Saint Louis is one of the oldest Harvard Clubs in the world. The HCSL's core purposes include interviewing candidates for admission to Harvard College, organizing social and educational events for St. Louis alumni, and participating in community service activities for the benefit of those in the St. Louis region. We serve Harvard University alumni regardless of school or degree and are proud to include graduates from the College, the Law School, the Business School, the Kennedy School, the Medical School, the School of Education, the Divinity School, and GSAS among our members and board. We would be honored to have you join our Club as a member. For more information, click here.